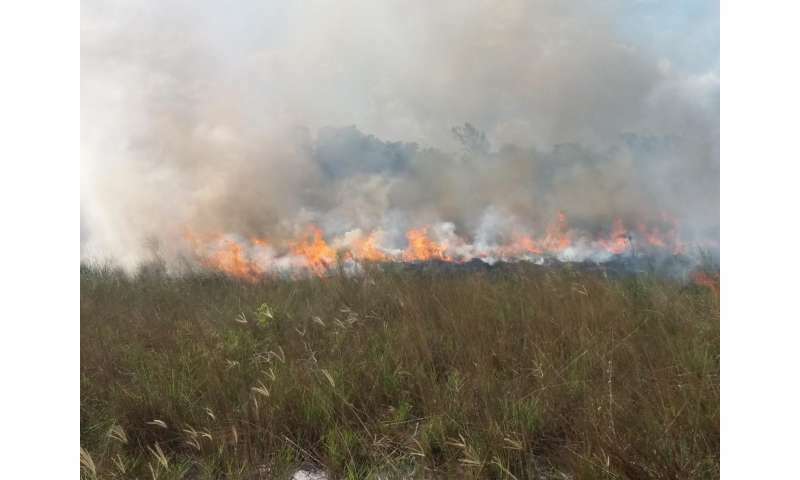 The world's open grasslands and the beneficial fires that sustain them have shrunk rapidly over the past two decades, thanks to a massive increase in agriculture, according to a new study led by University of California, Irvine and NASA researchers published today in Science. 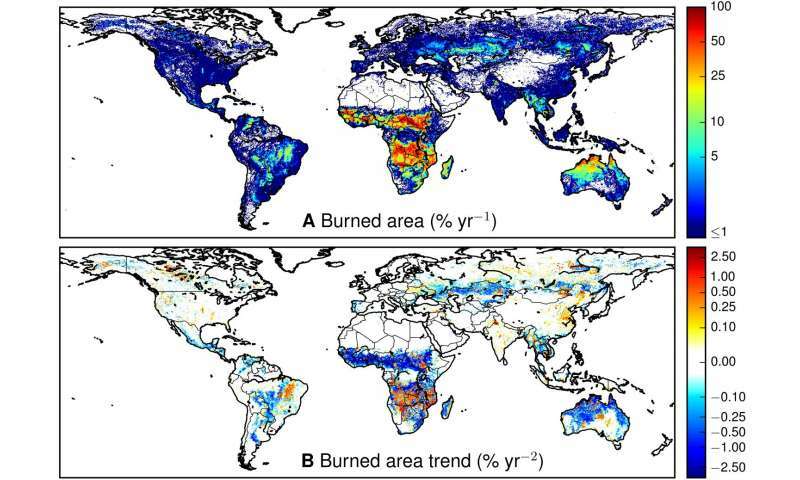 Analyzing 1998 to 2015 data from NASA's Terra and Aqua satellites, the international team found that the total area of Earth's surface torched by flames had fallen by nearly 25 percent, or 452,000 square miles (1.2 million square kilometers). Decreases were greatest in Central America and South America, across the Eurasian steppe and in northern Africa, home to fast-disappearing lions, rhinoceroses and other iconic species that live on these fire-forged savannas. 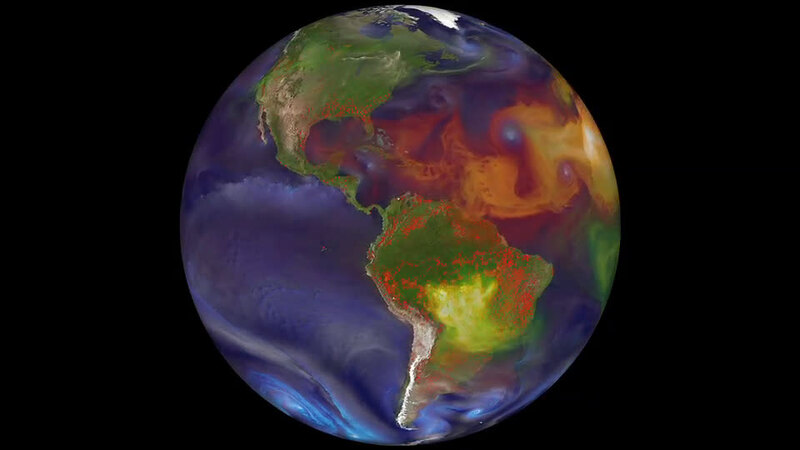 "A billion and a half more people have been added to the planet over the past 20 years, livestock has doubled in many places, and wide-open areas once kept open by fire are now being farmed," said James Randerson, Chancellor's Professor of Earth system science at UCI. "Our fire data are a sensitive indicator of the intense pressure humans are placing on these important ecosystems." Modelers had forecast that as global temperatures rose, fire risk would soar. But the researchers learned that widely used prediction tools didn't account for surging population growth or the conversion of grasslands and subsistence farming to industrial agriculture in some of the world's poorest regions. Fire has been an important factor for millennia in the maintenance of healthy grasslands, which support many large mammals. Without occasional blazes, trees and shrubs encroach on this habitat, which covers about a fifth of the planet's terrain. The researchers discovered a profound transformation over the past two decades. 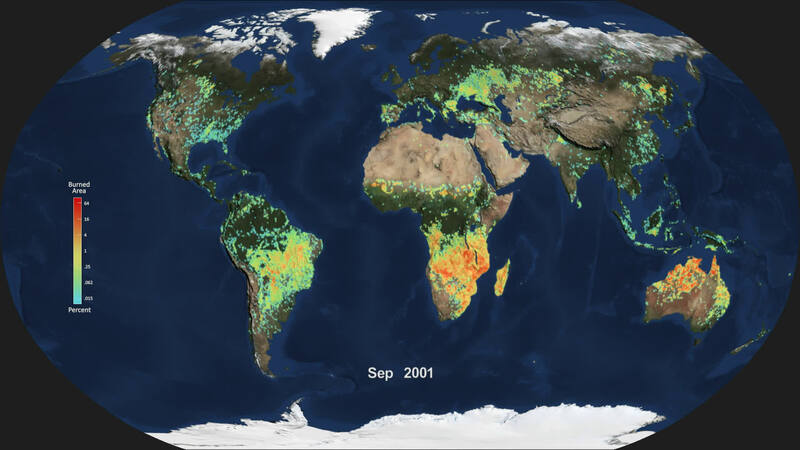 "Satellite images revealed clear relationships among the rapid disappearance of fires from grassland ecosystems across the world, human activity and changes in plant cover," said lead author Niels Andela, a research scientist at NASA's Goddard Space Flight Center and UCI. Sharp increases in the number of livestock, the expansion of croplands, and new buildings and roads have fragmented the savannas and reduced highly flammable dried grasses. The expanses have become prized assets for private landowners who want to prevent brush fires. 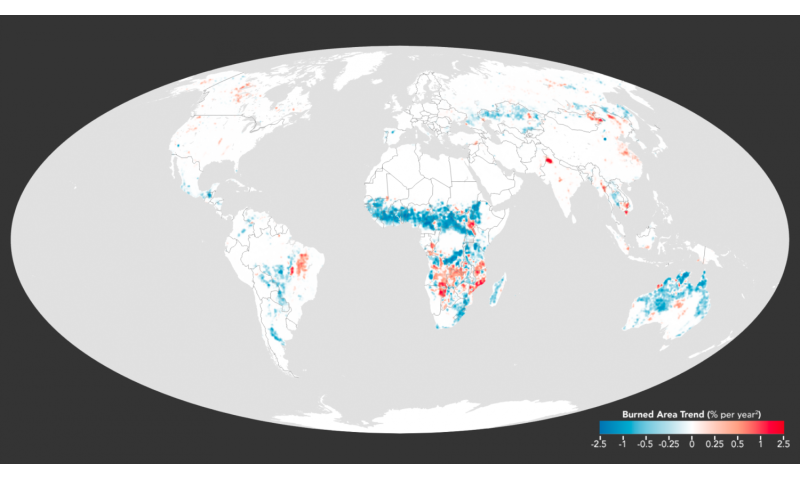 Unlike international efforts to combat tropical deforestation, there's been less focus on protecting these vast semiarid stretches. "Humans are interrupting the ancient, natural cycle of burning and recovery in these areas," Randerson said. Losing a fourth of the planet's fires has benefits, increasing storage of dangerous carbon emissions and reducing lung-damaging smoke. But the drop-off in smoke in the atmosphere also allows more sunlight to reach the Earth's surface, causing more global warming. The change is not uniform. Consistent with previous reports, more wildfires have occurred in the western U.S. and across North American boreal forests, where climate change is lengthening the fire season and drying out flammable vegetation faster.